Having been the first McQueen show since Lee's suicide, last season's collection showed itself through a subtle presentation. Now, nearly a year on, Sarah Burton was mentally prepared for a full-scale catwalk, and what a show it was. Showing the best outfits first, a handful of models with clothes clearly inspired by Navy seamen took to the floor. Starting with a magnificent over sized bright red coat it only got better. 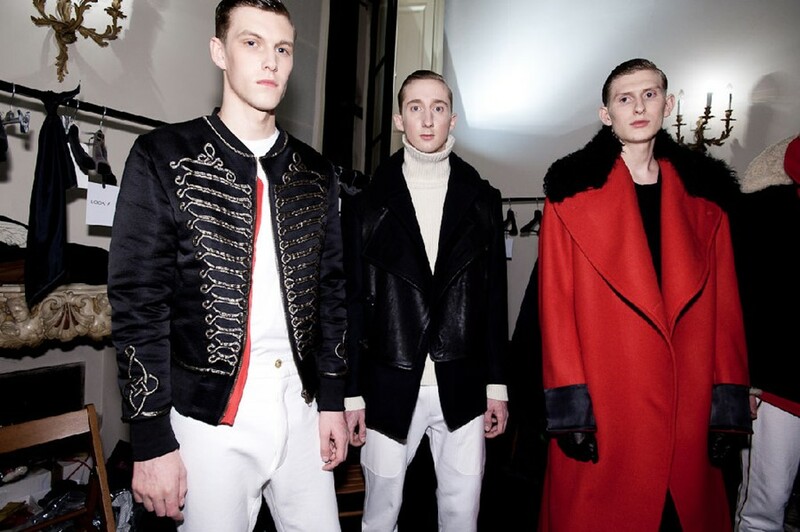 Pea coats underneath leather gilets, donkey jackets and grandiose capes, many of them with typical McQueen golden embroideries on the back of the collar, took the audience with storm. Moving on to a suit jacket and bomber jacket in gold satin, we saw some of that twisted glamour associated with McQueen himself. Pinstriped tailoring with fur collars, belted coats, suit jackets with gently ripped shoulders and elastic trouser hems were all part of the show. And all the time we were treated to military marching music; truly inspiring.